PORTANT has grown from a small, sports-specific shoes line to a worldwide brand. PORTANT manufactures kinds of shoes to suit your need: PORTANT products feature technologically advanced designs and materials to improve the comfort and performance of shoes. We pay much attention on premium quality and service, we focus on the Health and Excellence. - Fashionable athletic footwear for all activities whether you're going on a run or any occasion. - Shock absorber sole adopts technology that dynamically adapts with each foot strike to the ever-changing amount of force placed on the foot during the run. It's soft and protective to cushion your every step. Applications: casual, walking, running, indoor, sports, outdoor, travel, exercise, workout and any occasion. Spuer lightweight and breathable mesh upper sport shoes, expand with your foot when you run and they more comfortable closely fit to help you reduce irritation. The non-slip rubber soles with high elasticity and good softness can be bended freely, adapting to the ground for stability and working strategically to optimize the unique properties of every touch and push. 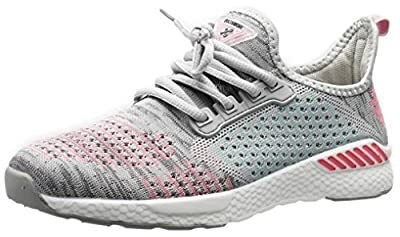 Comfortable shoes and fashion unique durable, safe environmental protection material, arch support insole gives the midfoot the best support when you move. 100% brand new guarantee, 100% high quality guarantee and 100% best customers service guarantee, If you are not satisfied with your purchase, please contact us within 24 hours after package signed.